But... the main star won't sing... also not for the spectators outside.. I can confirm the flight is certainly going to take place and there are still seats available! So, the flight might still be very interesting! The flight number is HQ 9722.
sn26567 wrote: The flight number is HQ 9722. Flight number changed to HQ8722. Unfortunately the little post perihelion activity is fading away real fast. HQ8722 now circling above North-East Netherlands at FL390. They landed at BRU at 08h07 ! Which member will be first to post what they have seen? Flight organised by Urania through The Aviation Factory. The meeting point was the Thomas Cook registration desk, row 11 at Brussels Airport, at 04:45. A special Swissport check-in desk was reserved for that flight, next to all the Thomas Cook charters check-in. We received a last information sheet from Urania, saying that the brightness of the Ison comet had faded a lot, but with binoculars and a bit of luck we might be able to see (or to guess) something. We received a very special boarding pass: from BRU to BRU (for me it was a first). A special boarding pass: from BRU to BRU! Boarding was at Gate A36. No flight indication whatsoever, neither in the main hall, nor at the gate. A very special flight indeed (or maybe they just don't have BRU in their destination list). At 05:30 we were bussed to the aircraft which was at a gate in the B terminal for a fast but orderly boarding through the stairs of the jet bridge. Warm welcome by the two stewards and the sole stewardess. There was ample room for everybody, with about 90 passengers, so that almost everyone could have a free seat next to him. I had seat 2A without neighbours. I thought "fantastic", but it was too close to the galley where the steward was preparing the meals for the cockpit and the drinks for the passengers, with the light on during the beginning of the flight. Else, the lights were kept off during the whole flight, except take-off and landing. I could alleviate the (small) problem by putting my jacket above me. We left the gate on time and proceeded quickly to runway 25R, where we took off just behind a JAF 738. Quick ascent above the clouds to FL 390 (by special authorisation of Eurocontrol, otherwise we should have flown at FL330). We flew in direction Amsterdam, which was covered with clouds, but those closed were orange with all the lights of the city. Not very good for observation of the sky. A little further north the clouds disappeared. The Urania people gave nice explanations about the stars, left and right of the aeroplane. 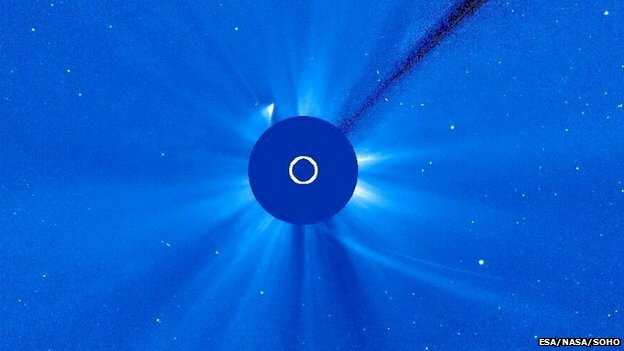 ISON should have appeared over the horizon at 06:40, but by then the first light was already appearing and the comet had lost too much of its brightness to be visible, even with binoculars. I nevertheless learned a lot about the Pleiades, Orion, Sirius, Vega and the other bright stars, the small sickle (crescent) of the moon 36 hours before the new moon, the planets Saturn and Mercury, etc. I also was lucky to see a shooting star. I was like an AvGeek among the AstroGeeks ! The plane made several U turns above north-east Netherlands near Groningen, to enable everyone to see both East and West of the sky. And soon it was already time to return, because the sky was becoming clearer by the minute, even though the sun would not appear before landing. Dutch greenhouses lit through the night. For the culture of cannabis? We were in the air a little longer than foreseen and landed at 08:10 on 25L to be at a B gate at 08:15. Instructive flight, even without seeing a comet. Pity of the lack of comet but seems a nice and special flight anyway! Thx for the nice report and the nice pic of Saturn and the moon..
2. The next big trip organised by Urania will be for the total solar eclipse of 2015. It will be an 80% eclipse in Belgium (at Urania they say Flanders), but a total eclipse in Iceland, to where they will organise a flight. Thanks for the excellent trip teport Andre! Too bad I couldn't join (as neither could I witness the first QR B787 arrival at BRU). Thanks for the additional info regarding Urania trips! sn26567 wrote: There was ample room for everybody, with about 90 passengers, so that almost everyone could have a free seat next to him.